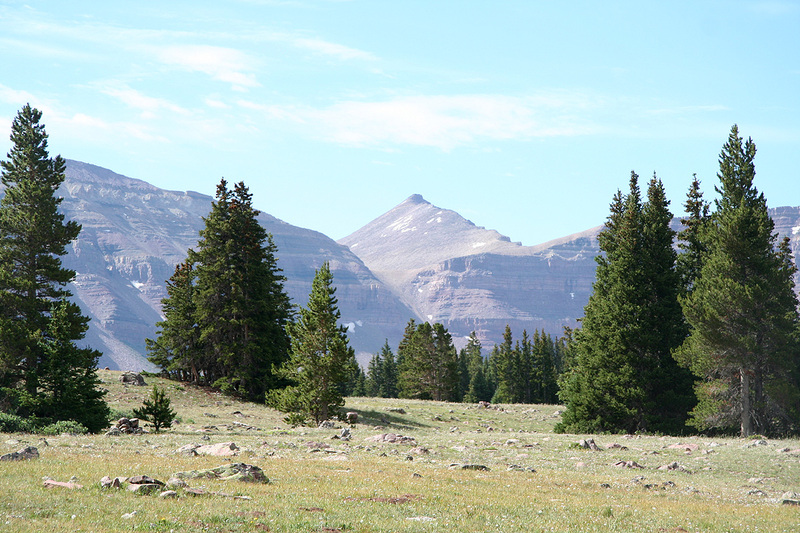 4 How to get there: This peak is the highest in Utah, but the easiest access goes via the state of Wyoming. From Salt Lake City, locate Interstate I-80 and go east. Your travel distance on I-80 will be somewhat more than 100 miles. Travel through Park City and continue east to Wyoming. In Wyoming, pass the city of Evanston and continue to Exit 39. Exit here, and start measuring the distance from the freeway as you go south on Hwy. 414. You will see signs for Urie, and further south along Hwy. 414, the small town of Mountain View. Go straight at mile 2.7 and enter Mountain view at mile 5.1. In Mountain View you may find food (grocery on your right) as well as gas and few restaurants. At mile 5.9 (south in MOuntain View), turn right and enter Hwy. 410. At mile 12.9, Hwy. 410 turns right while you should continue straight on a wide, good dirt road. You enter the Wasatch National Forest at mile 21.2, then at mile 25.0 you turn left. Continue along the main (wide) dirt road until you enter a large, left curve at mile 28.7. The road to Henry's Fork Trailhead continues straight ahead here as a somewhat smaller road. Continue straight at mile 32.0 and keep right at mile 34.7. You arrive at the trailhead at mile 35.3. The road can be driven by ordinary cars all the way. Find parking here, location N40:54.564, W110:19.869, elevation 2875 meter. Route description: This is a long hike, but with a very good trail most of the way. 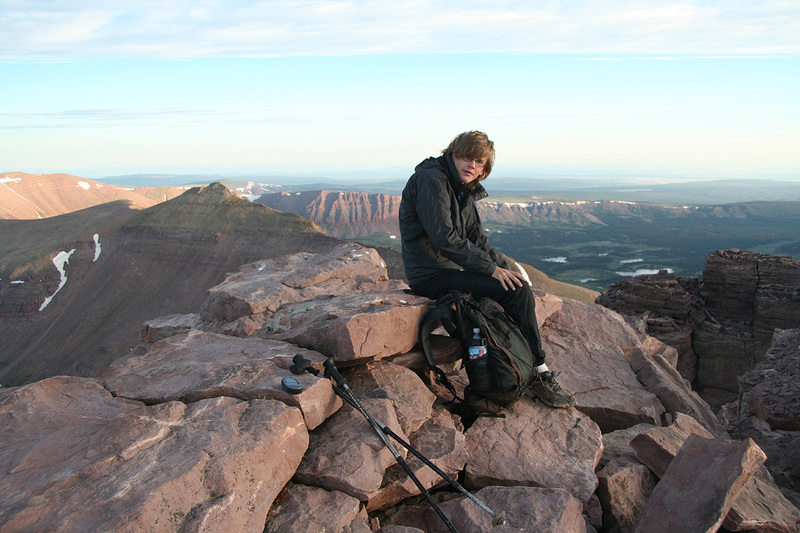 The climb can clearly be done in a single (long) day by a strong hiker, however the "standard approach" is to make it a three day climb. Aside from the distance, a single day effort has an increased risk due to the possibilities of thunder in the afternoon hours. 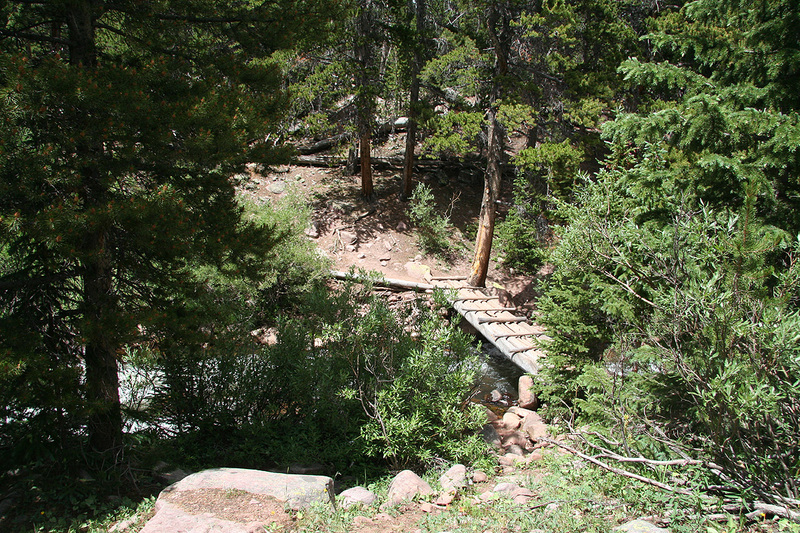 From the trailhead, proceed along the very good trail as it follows the river along its right side (when going uphill). The terrain is dominated by forest and the trail is sometimes close, sometimes a bit more away from the river. The elevation gain is so gradual that one almost never notice it. The first important waypoint is really the crossing of the river. There is a foot-bridge at this point, clearly marked by signs. After this crossing the trail runs parallel to the river, crosses a short section of trees before emerging into open meadows. This is where you clearly can see the mountains that borders the basin, in particular, Kings Peak is clearly visible more or less straight ahead as you look through the Anderson Pass. The trail continues across the meadows and crosses another brief section of trees before more meadows. Many hikers make camp in this area and spends to nights with a summit day on the second day of their hike, then hiking back out on the third day. From these meadows, one can also clearly see the three variations of the route that are possible further onwards. Anderson Pass is the pass across which you see Kings Peak. To the left (north-east) of this pass is a rounded mountain (3994m), then Gunsight Pass on its left side. Alt. 1 Follow the good trail up and to the top of Gunsight Pass. Immediately on the other side, a very clear trail traverses right, (towards the slope of the 3994 meter mountain), then climbs the slightly steeper section (very short) before gaining the fairly flat, broad shoulder that provides immediate access to the valley between this peak and Kings Peak. The trail is partly marked with cairns in the short, steeper section (YDS class 2 terrain). This route will continue across a fairly flat, but rocky area in order to meet the main trail near the place where the ridge on Kings Peak comes down towards the Andersen Pass area. Alt. 2 Leave the trail well before it turns into the short valley leading up to Gunsight Pass and pick a route that will get you to the bottom of the pretty distinct gully coming directly down from Andersen Pass. Scramble up this 300 meter gully (it was snow free at the time of our climb), then merge back with the other routes just beyond Andersen Pass. This gully is likely to be about YDS class 2+, however, since I have not climbed it this is just guessing based on trip reports written by others. Alt. 3 Follow the main trail to Gunsight Pass and continue along this trail as it descends to the basin below before turning right around the cliffs and then ascends back up into the valley that gently climbs to the Andersen Pass area. This variant is YDS class 1 until reaching the beginning of the summit ridge. From the Andersen Pass area, all three alternatives merge and follow the obvious ridge to the summit of Kings Peak. To be more precise, the route tend to stay a bit on the left side of the top ridge as it climbs upwards. The right hand side (when going up) of this main ridge is rather steep. This section is again YDS class 2, quite similar to the short section described in Alternative 1. In my opinion, Alternative 1 above, is by far the best and the route that should be preferred. The short section of class 2 terrain is not more difficult than the top ridge, thus if a party intends to climb the peak they may as well also cross this terrain. Alternative 2, is clearly the most direct, but also the steepest variant. However, Alternative 1 is only marginally longer and clearly a much safer as well as more pleasant route. I did this hike with my son Pål Jørgen. We started from Snowbird near Salt Lake City in the morning and were ready to leave the car at the Henry Fork Trailhead at 1230. There were quite a number of cars parked at the trailhead and obviously many other parties that wanted to climb this peak. We rested near the foot bridge that crosses the river, hiking there took about 2 hours. 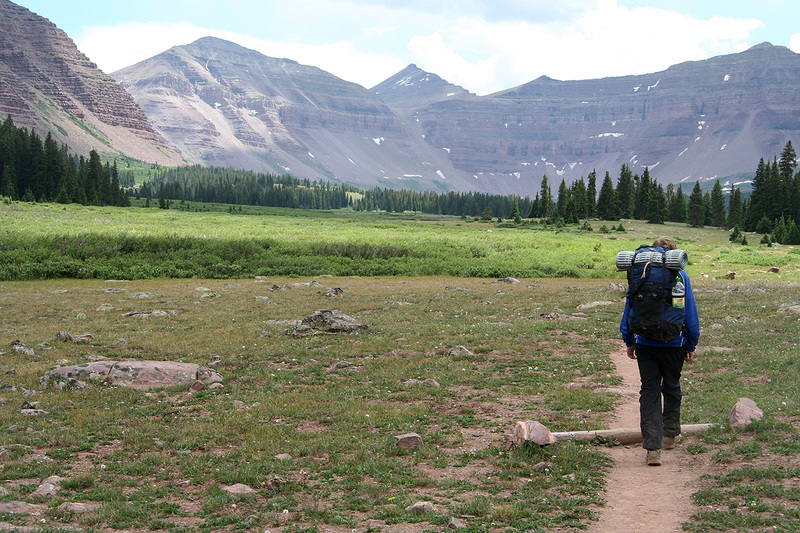 As we continued across the more open meadows we soon observed tents, it is clear that most parties allocate 3 days - one day to hike into the upper parts of the large basin, one day to climb the peak and then a third day to hike back out. We did not carry a tent and had decided to make this climb in a 2 day effort. Thunder started and some rain developed, fortunately not much. 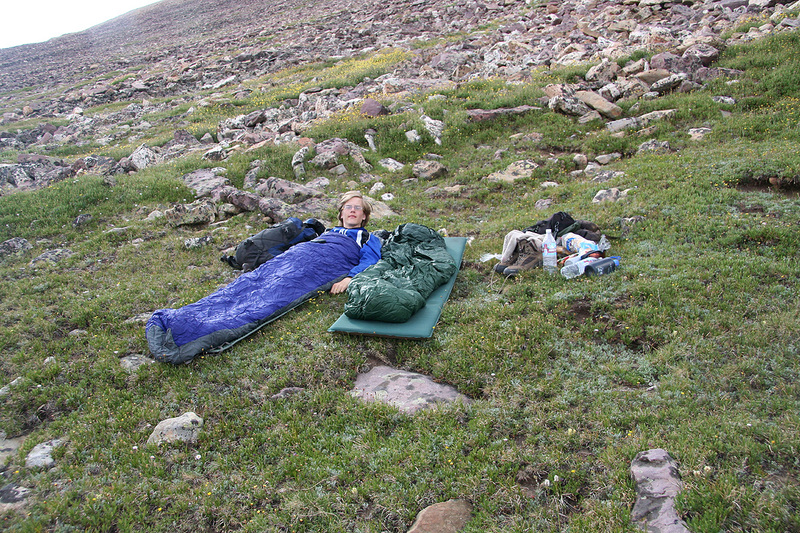 We carried sleeping bags and rain gear, but the hope was that we would avoid rain during night. Still, we decided to just make a break and wait out the rain. At this point, we had hiked for about 3.5 hours. The rain ended almost as suddenly as it had started, however, I quickly discovered another problem. This area was really full of fairly agressive mosquitos. Having forseen this, we applied some mosquito-repellent spray on bare skin as well as on my wool shirt. Unfortunately, with rather limited effect. In particular, I sprayed my right shoulder extensively, but after the trip I could count at least 20 mosquito stings just there. It looked like the spray had the exact opposite effect, informing the mosquitos that this was an area that could be attacked. 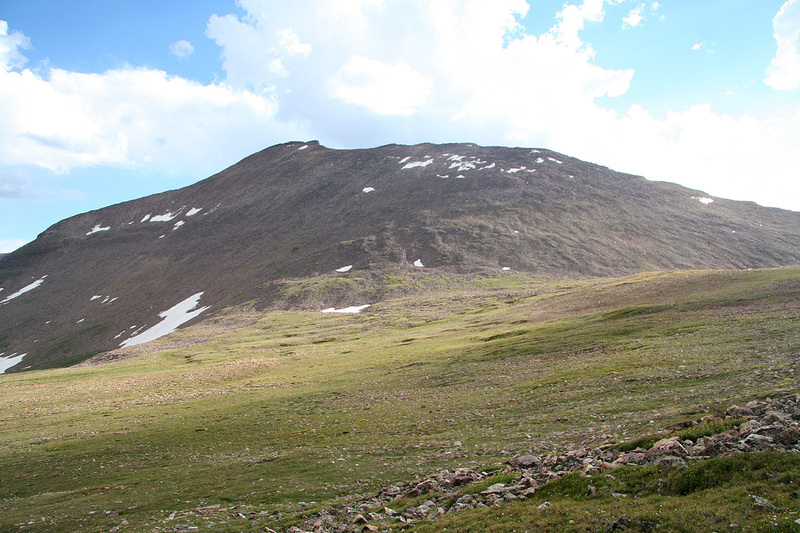 We continued on to Gunsight Pass, arriving there around 1645. The weather was still unsettled and we decided to wait at this pass and see how the weather developed. By 1800, it seemed pretty clear that we would not have any more thunder that night. We therefore continued the nice traverse around peak 3994 and entered the slopes of the high valley that runs between this peak and Kings Peak. The time was 1830, we were at location N40:47.298, W110:21.834, elevation 3763 meter. Happy with our progress, we decided to rest and sleep right there. Obviously, the hike to the summit would be a rather easy and short trip the next morning. The night was clear with thousands of stars, then later a very small moon appeared before daylight gradually returned around 0500. We started out at 0550, having decided to return for breakfast after a trip to the summit. It took us less than one hour to the summit and we enjoyed the view for quite some time. This peak is certainly located in a big wilderness area. There are huge basins with chains of mountains in every diection. It occured to me that a crossing of this area using skis in the winter must be a good project. 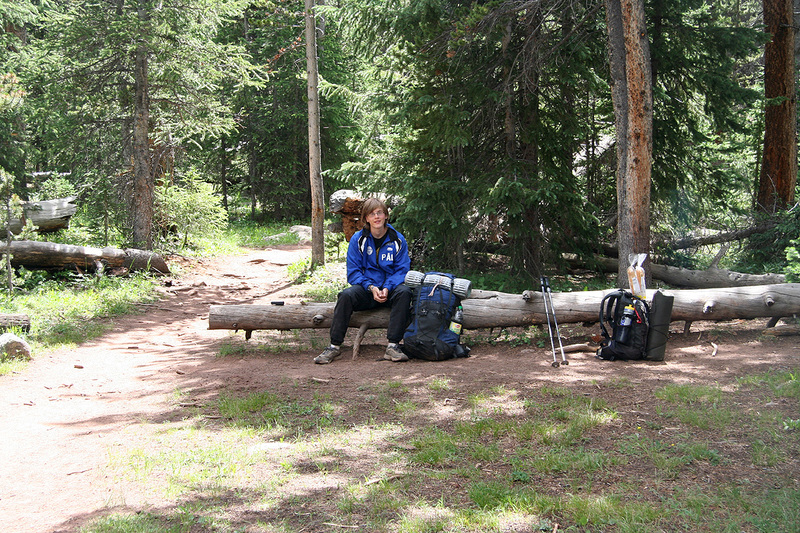 We returned to our primitive camp for breakfast around 0800, then started on the hike out. Reaching the car at 1220, we felt that this trip was a good way to conclude our Ultra prominence hiking in the USA, in the summer of 2008. 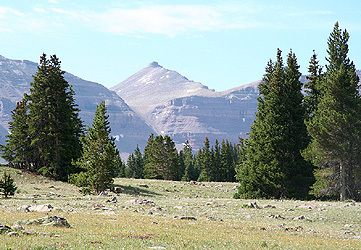 Kings Peak, as seen when emerging from the forest. Kings Peak, as seen from our camp. 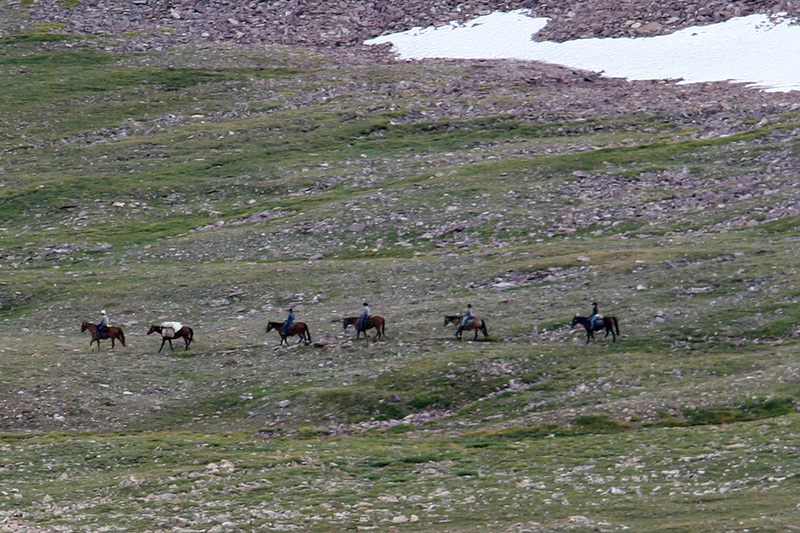 Horses coming down from Andrews Pass in the early evening.